the new Nissa from War of the Spark might be great in this deck, since she makes all your lands indestructible with her ultimate. pair that with Ambush Commander and you have an army of indestructible 1/1's and if you run Ezuri, you can make them 4/4's. 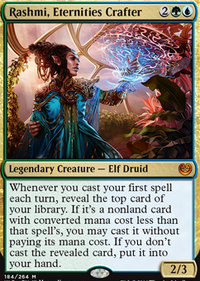 I do understand that this is budget and Nissa might cost a lot, we don't really know yet, Ezuri might be out of reach since he's 4 $, but it is something to consider for those that can afford it. Thanks for comments Apollo_Paladin , appreciate it. I'm not big fan of Ambush Commander , as you said he is kinda mana heavy. 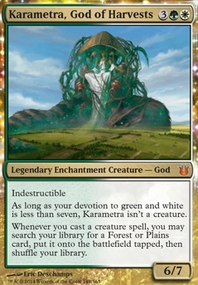 He might be ok for sideboard to get with Living Wish but i cant think of case when i would want to search him. Jagged-Scar Archers sure should be in sideboard to deal with flying creatures. About Wirewood Pride , maybe. I personally rather have more elf's and faster ramp. Totally agree with Throne of the God-Pharaoh , i will add one to my deck. 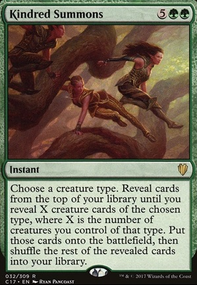 I think i have card draw handled, you suggested Sylvan Messenger , i have similar effect Lead the Stampede i was considering messengers but chose stampede instead because i have some non-elf creatures. And about Vanquisher's Banner instead i have Beast Whisperer , i think either will work but i prefer elf instead of artifact. Ambush Commander isn't terribly expensive dollar-wise (just over a buck last I knew), but he's a little heavy on mana cost. That's generally not an issue for an elf deck, particularly because I see you're running Priest of Titania and a bunch of other mana producers along with Vitalize which is one of my favorite cards ever in my elf deck. 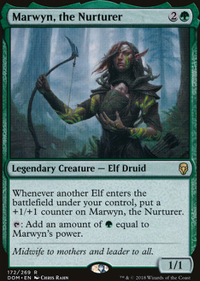 Jagged-Scar Archers is a good way to deal with flying, even if you just sideboard a couple ultimately, and Wirewood Pride is a very mana-efficient way to ramp up your damage early, or provide a surprise blocker for a big creature out of one of your 1/1's. Throne of the God-Pharaoh is an excellent and cheap way to add an alternate win condition to an elf deck; it's done stellar in mine since you can just tap your 1/1's for mana to deal damage rather than have them attack (even if you don't need to spend it). The only other thing I can suggest is some card-draw. Elf decks of this nature tend to speed through their hand fairly quickly. I use Sylvan Messenger and Vanquisher's Banner personally. You can check out my Legacy Elf deck entitled "Tae'rin Terror (Elf Zerg)" if you want some other neat options for elf synergy. It's not a "budget" deck, but there's no card in there over 6 or 7 dollars. 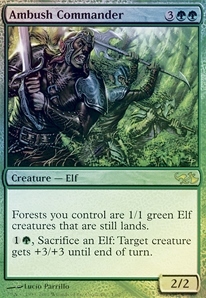 Also, there are so many good elf cards that it's impossible to make determinations on the "best" for many cases, but I've had mine going for quite a few years now and it's continued to speed up. All about that Elf Count for the real craziness, imo. Hope this helps, giving a +1 on this deck either way just for using Vitalize ; that's one of the more overlooked ones it seems and I've been able to recommend that to quite a few elf decks in the past. Way to be on top of it! Throne of the God-Pharaoh is one of the most consistent win conditions in my elf deck (Tae'rin Terror is the name of the deck). 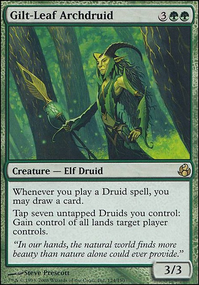 As for Ambush Commander , I've never had a problem with mana generation, but my build is slightly different as well, utilizing Llanowar Elves , Priest of Titania , and Elvish Archdruid . 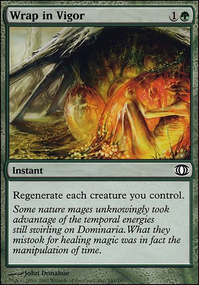 I also rely heavily on Vitalize which is a super-easy way to generate huge amounts of mana even early-game with all of the mana tap elves. To each their own, though. Props on a nice deck either way. MindAblaze on Necrotic Ooze and Summoning Sickness? 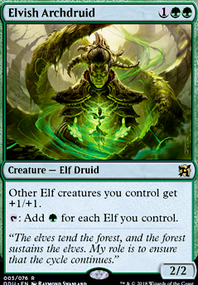 Ambush Commander limits your ability to tap forests that enter the battlefield while AC is out as they are also suffering from summoning sickness because they enter the battlefield as both Forests and 1/1 green elves.